This case report describes the evaluation and treatment of a 31 year old Quarter Horse gelding that presented with acute, severe hindlimb ataxia. Based on the clinical signs, a tentative diagnosis of lumbar spinal cord impingement was suspected. Due to the long term prognosis associated with previously diagnosed pulmonary neoplasia decision for palliative care was made. Electro-acupuncture and massage therapy were utilized in the management of this case. Significant improvement in patient demeanor and ataxia were noted after institution of therapy. Four weeks after initial presentation, the patient declined again and the owner elected euthanasia. Blaze, a 31 year old Quarter Horse gelding, presented for evaluation of an acute, severe hindlimb ataxia. The owners noticed that he was unstable on his hindlimbs during the previous 24 hours. He had previously been diagnosed with osteoarthritis of his hocks and stifles by another veterinarian, however, he had never exhibited this amount of weakness in his hind end. In addition to the previously diagnosed osteoarthritis, Blaze had also been diagnosed with pulmonary neoplasia 8 months previously. The latter diagnosis was made with ultrasonographic findings (mass seen in left lung field) and cytology of a pleural effusion sample. The pulmonary signs had been managed initially with drainage of the pleural effusion, corticosteroids and antibiotics. Since then, he has been maintained on intermittent clenbuterol to improve lung function. On follow-up ultrasound examinations, the mass did not change nor did the pleural effusion return, but Blaze did have labored breathing as ambient temperatures increased. A physical exam was performed on the day of presentation. Vital parameters were within normal limits, with the exception of respiratory rate, which was increased. He appeared kyphotic in his lumbar spine. A neurological examination revealed normal cranial nerve and thoracic limb function, but severe deficits in the hind limbs. While walking in a straight line, his hind end drifted to the left. He was unable or unwilling to allow his back legs to be picked up for more than a few seconds at a time. There was evidence of severe weakness in both hindlimbs when a tail pull was performed at a walk as well as standing; the right was more severely affected than the left. Significant atrophy of the gluteal muscles was present. Proprioception appeared to be intact on the forelimbs, but deficits existed in the hindlimbs. A myofascial exam revealed severe sensitivity over the lumbar spinous processes as well as the thoracolumbar epaxial muscles. The muscles of the shoulder contained tight bands and multiple trigger points. Flexion of the neck was normal. Rewatching the videos after treatment, it is clear that Blaze is also exhibiting ataxia in the forelimbs along with the hindlimb deficits previously described. He is much more ataxic in the hindlimbs than the forelimbs. Therefore, the lesion localization must be in the cervical spine. 4) Trigger point pathology in caudal neck and shoulders: Compensation for chronic arthritis in hind limbs. Because of the limited ability to do diagnostics in this case, a definitive diagnosis was unobtainable, but the most likely diagnosis was lumbar spinal cord impingement due to chronic progressive vertebral arthritis or a neoplastic process. 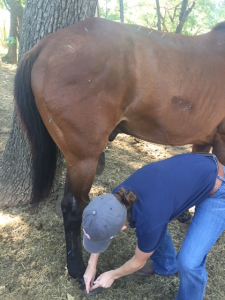 The decision to use electro-acupuncture to treat Blaze’s hindlimb ataxia was based on the principle of neuromodulation as well as endogenous opioid release and for analgesia. The anatomical lesion location was determined to be between T2-L3 because of the clinical signs of normal forelimb function with severe hindlimb paresis and ataxia. This was revised after rewatching the video after treatment, but at the time of the treatment protocol decision-making, this is where the lesion was presumed to be. Myofascial palpation was used to further narrow down the localization based on where sensitivity was noted along the spine. This was most obviously exhibited from the thoracolumbar junction to L3. Neuromodulation of the caudal thoracic and lumbar spinal segments should help restore some function whether or not the presumed thoracolumbar spinal cord impingement was due to a neoplastic process or from chronic arthritic changes in the spine. 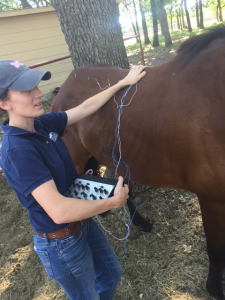 Neuromodulation at these sites would also help stimulate peripheral nervous activity in the muscles of the hindlimb, therefore encouraging muscle strength and return to function. Distal points were included for this reason as well. The frequency of treatments was decided upon based on the seriousness of Blaze’s condition. If Blaze had a chance of survival, he needed functional hindlimbs. Therefore, it was decided to treat for three consecutive days. 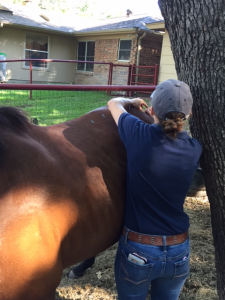 After these treatments, Blaze had improved significantly and the decision was made to attempt weekly acupuncture treatments and monitor for any relapse of clinical signs. Each session began with the same three points for calming and relaxation: GB21 bilaterally and Bai Hui. Points along the inner bladder line were chosen because of their proximity to the exiting spinal nerves. These varied with treatment, but BL 13-15, 20-30 were all used. Other points along the pelvic limb were used based on myofascial exam along with lameness assessment. These included BL 39, 40, 54, 60, GB 29, GB 30 and KI 3. These were done bilaterally during some sessions and only on the right hindlimb in other sessions as this limb appeared to be more severely affected on those days. 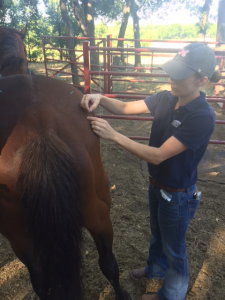 The hindlimb ting points were used as distal points to augment the central neuromodulation. Trigger point pathology and myofascial restriction were treated in the neck using cervical spinal points. ST 36 and LI 11 were both used in different sessions for their autonomic influence. During his first two treatments, Blaze used a tree to lean his left side against because he was too weak to stand square. At his third treatment, he was able to stand square for the majority of the session. He showed significant improvement in ambulation after the initial treatment session. He was able to walk in a straight line without fading to the left. This improvement was maintained for nearly 28 days. On his last treatment, he appeared to be ambulating very similarly to his initial presentation. Four days later, the owner reported that he was no longer able to ambulate and had become very weak in his hind end. Humane euthanasia was elected at this point. This case taught me a difficult lesson about acupuncture: There are some things that acupuncture cannot treat, but it can give a patient a better quality of life in his last days. Discussions with the owners about options for this horse did include euthanasia due to his age and the fact that the cause of his clinical signs was likely spinal cord compression that could not be cured. They decided to give acupuncture a chance to give him a little extra time and we are convinced that the acupuncture did give him an extra, relatively comfortable, four weeks of life. Watching video of Blaze ambulating while writing this case report, it became obvious that although I treated his lumbar spinal cord and saw marked improvement, that he likely had cervical spinal cord compression based on his forelimb ataxia. Looking back at the case, I wonder how much more of an impact I could have had with my acupuncture treatment if I had included more cervical spinal points. The recommendations for the owner of this horse had been to be careful when working around him, especially on his hind end. He had retired from riding 10 years ago. If he had been a potential riding horse, I would have recommended to discontinue riding because of the risk to rider injury. There are not very many studies involving horses with compressive lesions treated with acupuncture. But extrapolation from studies in dogs is possible. In one retrospective study from the Pakistan Veterinary Journal in 2015, Ching Ming Liu and Chung Tien Lin found that dogs diagnosed with lumbar IVDD and treated with Hua Tuo Jiaji points, GB 30, GB 34, LV 3, LI 4 without surgery had a better success rate (95%) with a shorter recovery time (27.5 days) than those that had surgery followed by acupuncture treatment (74% of dogs and 53 days respectively). In another retrospective/prospective study from 2010, Joaquim, et al found that dogs that received acupuncture alone had a higher success rate than surgery alone and surgery with acupuncture had an intermediate success rate. The success of acupuncture in these IVDD dogs may be useful when evaluating lumbar disease in the horse, although, horses may have a different pathophysiology for spinal cord disease. Therefore, these studies can help guide our treatment in horses to a point, but further research on the topic needs to be done with well controlled prospective studies, especially in horses. Liu CM and CT Lin, 2015. Retrospective study of a new standardized acupuncture treatment protocol on thoracolumbar spinal cord diseases in 84 dogs. Pak Vet J, 35(4): 461-465. Jean G. F. Joaquim, Stelio P. L. Luna, Juliana T. Brondani, Sandra R. Torelli, Sheila C. Rahal, and Fernando de Paula Freitas, 2010. Comparison of decompressive surgery, electroacupuncture, and decompressive surgery followed by electroacupuncture for the treatment of dogs with intervertebral disk disease with long-standing severe neurologic deficits. JAVMA, 236(11): 1225-1229.